Wolves have been gaining plenty of plaudits for their demolition of the Championship this season, but one aspect of their play that has flown under the radar is their use of set-pieces. So far Wolves have scored 10 goals from 199 corners (giving them a 5% conversion rate) this season that has helped them cement their place at the top of the table. Below I examine how they’ve done this, and how teams could potentially set-up to prevent conceding from corners against them. The Wolves spacing is interesting here – with an emphasis on attacking 3 areas – the near-side of the 6-yard area, the middle of the 6-yard area and the back post area. All 3 areas are targeted with height with Leo Bonatini (#33), Roderick (#25), Danny Batth (#6) and Alfred N’Diaye (#4) all above 6 foot tall. Attacking multiple areas like this gives multiple benefits – firstly it spreads the opposition out (provided they primarily man-mark like Bristol City are) – allowing for a clearer run into the areas where you ideally want to attack the ball. Secondly it provides a buffer of sorts if the delivery of the set-piece isn’t fantastic (this would be ideal for lower league teams) for instance if the focus of the corner is the back post, that is where you’ll want a number of your players to attack – but if the delivery is poor and falls towards the near side of the 6-yard area (where no players are attacking) then that’s a potential chance wasted, by spreading players out you’re covering most of the main areas. The last reason is second balls, if a player gets contact on the ball but can’t direct it goalwards, there’s a strong chance that it will fall to a team-mate to potentially have a shot, as demonstrated here as Bonatini (#33) manages to connect with the ball on the corner of the 6-yard area, flicking it across goal for Diego Jota (#18) to stab home from close range. Again we see similar components to the first goal but with a bigger emphasis on attacking what I deem to be the most crucial area to attack – the middle of the 6-yard area. Wolves attack with numbers and height in this area, whilst keeping the option of both the near post and the far post. It’s hard to tell from the angle how the Bristol City marking ended up so bad, but it’s an easy practically unchallenged header from the exact area you don’t want opponents to be making those sort of shots. Alongside the key components from the Bristol City match (height + attacking multiple areas), we get a couple of new additions to the Wolves set-piece repertoire that we potentially were missing from the previous goals due to the angle of the camera. The first is the option of the short corner. Ivan Caveleiro (#7) provides the short corner option for Barry Douglas (#3) – as Caveleiro is a decent dribbler, it forces Norwich to put 2 players across to defend against it as otherwise, it would end in 2 vs 1 overload – or even worse a 2 vs 0 situation. This gives Wolves an advantage as Norwich have to sacrifice 2 players from their defensive set-up, whilst Wolves are only sacrificing one (as the corner taker is needed regardless). The next component is movement. Bonatini (#33) makes a run between 2 Norwich players, dragging them slightly out of position, creating a knock-on effect that allows N’Diaye (#4) to make a run into the space he’s just vacated with Willy Boly (#15) then exploiting the space left by N’Diaye. A combination of all the aspects demonstrated above. Cavaleiros presence next to Douglas draws out 2 defenders leaving a 7 vs 5 in Fulham’s favour. Jota (#18), Romain Saiss (#27) and Bennett (#5) all rush to the near side of the 6-yard box creating an overload on the solitary Fulham player defending that zone (their man markers are put at a disadvantage as they have to follow the run). Bonatini (#33) and Boly (#15) cover the secondary area waiting for a second ball making this a solid routine. 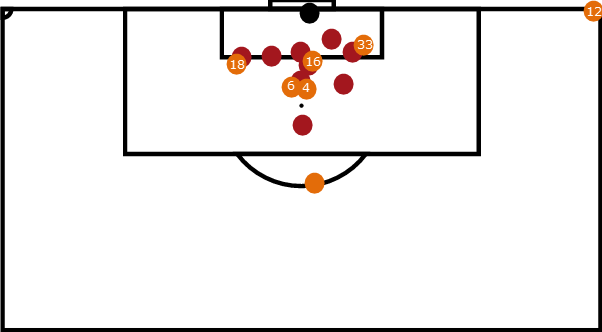 The overloading of the near side of the 6-yard box features again after the success against Fulham, with Jota (#18), Saiss (#27) and Boly (#15) all rushing that vulnerable area. We see a Bolton player stuck on the edge of the box, with a third Wolves player hovering there to potentially cause havoc alongside Cavaleiro and Douglas which weakens the penalty area allowing the overload to have a greater effect. Brentford put a heavy emphasis on defending their 6-yard box (the right approach to take considering Wolves previous corners) which helps hinder Wolves attacking runs, but the benefits of covering a multitude of positions for second balls pays off as the ball finds its way to the back post – causing a goalmouth scramble that Wolves eventually poke home. With 2 Norwich players defending the spot where Wolves usually make their runs to form the overload previously analysed, Wolves are forced to change their strategy slightly with only one player set to attack the corner of the 6-yard zone, they do however they keep rest of the key components already looked it – the man short to draw out 2 Norwich players and players spaced apart to provide decent coverage in the event of second balls or poor delivery. 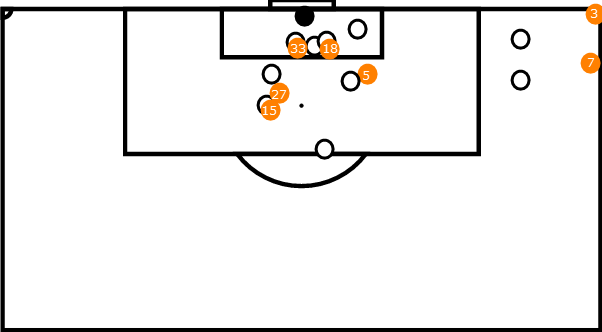 The overloading of the near side of the 6-yard box again makes an appearance, with 3 Wolves players dragging 5 Leeds players into that area which subsequently creates plenty of space in the middle and back of the 6-yard area for the Wolves players to attack. A prime example of how important spacing is. The Wolves players group in pairs each designated with an area to attack. The pair on the penalty spot attack the near-side area, the pair in the 6-yard area attack a mix of the central and near side areas whilst the 2 deepest players attack the back and central areas. The initial header rebounds off the bar – and as the players are spaced equally it’s a relatively easy header from close range. I believe Wolves highlighted the centre of the 6-yard area as Middlesbrough’s weak spot – keeping this area clear and the target of a majority of the attacking runs – bar 2 players attacking the back post, again showing how crucial a balanced approach at attacking corners is. Spacing players out so that they’re attacking different zones giving them the best chance of getting on the end of second balls. The option of the short corner to drag players out to defend – weakening the penalty area. Plenty of movement inside the box with a purpose – I’ve looked at plenty of teams before who stick 5-6 players in the box who make half-hearted runs into areas where they aren’t going to be competing for anything. The Wolves players have a plan and know how to execute it. A good set-piece taker. Most of the goals we’ve looked have come from one side of the pitch – where Barry Douglas’s left foot can deliver a pinpoint ball in, the Scotsman has 14 assists this season with 1.9 key passes per game – a great return for a wide player. Overloads that create space for other players to exploit. Knowing all this, how can teams set-up to defend against them? For a start, using all 10 outfield players will be a necessity, with 2 sent across to guard against the short, leaving us 8 players to defend against the 6 players Wolves usually commit forward. I’m not usually a fan of players on posts, but I would definitely put a player on the back post – a majority of Wolves goals coming from this area have been second balls that have found their way through to the back post meaning a player in this area is in a great position to stop this threat.